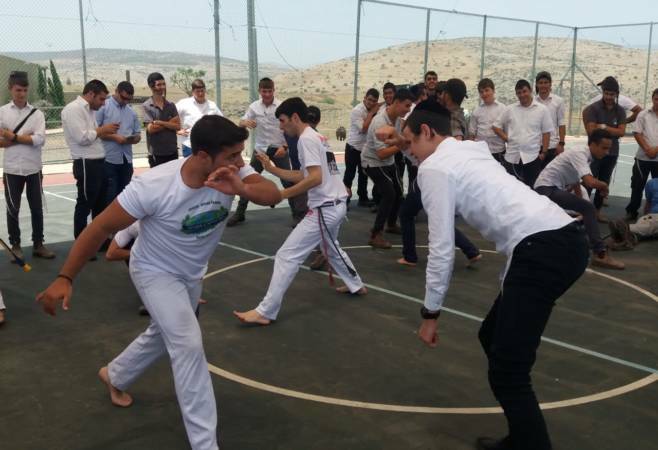 As part of the English-Speaking Village project, The Us Embassy in Israel set up a special Capoeira workshop in Sci-Tech Kfar Zeitim Torah Center. The workshop was led by the American Capoeira artist Ryan Johnson, along with Miki Hayat, a Israeli Capoeira champion who is a Haredi (orthodox religious) Jew. The workshop was designed to promote awareness to the concept of “a healthy soul in a healthy body”, and to introduce the students to the unique skills and qualities acquired through the art of Capoeira. The workshop was accompanied by representatives from the US Embassy in Israel: Mr. Terry Davidson, the US Embassy’s Counselor for Press and Cultural Affairs; Ms. Risa Levy, Cultural Affairs Specialist in charge of the embassy’s educational grants; Ms. Paulina Ashkenazi; and Ms. Laurabell Donigian. The representative for the Israel Sci-Tech Network’s HQ was Ms. Miri Varon, Head of Project Development & Management Section at the Sci-Tech Network’s R&D Center. Sci-Tech Kfar Zeitim Torah Center is home to an alternative Yeshiva for Haredi youth, offering its students a combined curriculum of Torah studies with secular subjects. Over 150 students attend this institution, majoring in subjects such as electricity, carpentry, ICT, and computer repair. Their study programme comprises intensive vocational training along with therapeutic activities, offering them an opportunity to grow up in a supporting and enriching environment. It has dual goals: to provide the students with tools that would help them lead a successful adult life, and at the same time to exemplify a unique educational model for thousands of students in other educational institutions in Israel.